From text files over presentations to blogs, it can all be done using mostly Markdown. And it is easy, too! This book introduces the reader to the Markdown syntax, teaches a few tricks on output styling and explains the various tools and frameworks that support Markdown. All this is done using an imaginary monitoring tool called "GoodTool", which - by the end of the book - has a README file, a website, a blog, a wiki and much more. It is the common theme helping the reader understand the different use cases. Finally, the book ends in a chapter explaining the "Making Of Markdown By Example" - yes, this book is not only about Markdown, it was also written in Markdown! 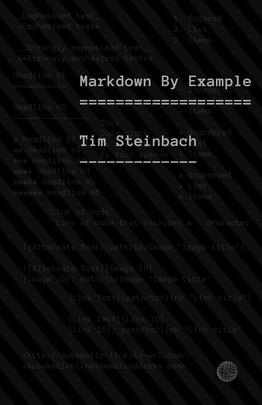 As part of the book, there is a Markdown wiki, which includes a full reference of tools used throughout the book as well as a subset of Markdown syntax instructions. This is the compantion repository for the book Markdown By Example. The file build_examples.sh builds all Markdown examples into HTML files or their respective output formats.